It was also a new look Dalry side that kicked off the game which quickly burst into action. The visitors forced two corners in quick succession but to no avail while Thistle hit back but Glens new look defence were giving nothing away. The Glens were moving the ball well and Bobby Colligan was proving a thorn in the home side’s defence as he and Eaglsham continually switched wings. A goal was on the cards and on 11 minutes Colligan cutting in from the left fairly rattled the post with keeper Stewart Strachan beaten. Two minutes later Ross Robertson, up for a corner, cracked a header off the face of the bar and following up slammed home the opener. Thistle were trying to play football but the visitors were in rampant mood with Colligan continuing to run riot, next laying it on a plate only for Gareth Campbell to shoot high over the bar. On 25 minutes after constant pressure Bobby Colligan cut in from the right and from the edge of the box he curled a great ball round the defensive wall and the helpless keeper. 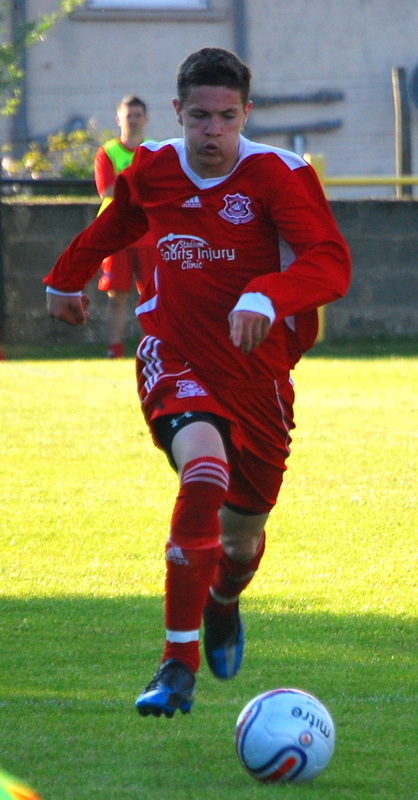 Thistle began the second period with a more hustling style and Glens were knocked out of their stride for a wee spell. Danny Naismith came into the back four and helped steady the ship. Back came the visitors with Eaglesham putting the ball into Colligan’s path but he shot high over the bar. In the 61st min Robertson thundered a header off the underside of the bar and the loose ball frantically scrambled clear by an over worked Dalry rear-guard. Glenafton: Semple Potter Robertson McKillen McEwan Colligan McKenzie Cochrane Eaglsham Armstrong Campbell subs: Dunsmuir Naismith Blackwood ; not used Dempster. This entry was posted in GAFC Match Report and tagged Ayrshire Weekly Press Cup, Dalry Thistle, Glenafton Athletic, New Cumnock, Scottish Junior Football. Bookmark the permalink.